The BRP Series is an economical way to convert any area into a quasi-Blast Room. The convenience of a Blast Room without the high cost associated with building one is the major benefit of this system. This industrial sandblaster system includes a High Capacity Pressure Pot, Sweep-In Media Recovery System, Media Abrasive Separator, and Dust Collector. The BRP Series – Industrial Grade, Direct Pressure, Blast Room Package, Abrasive Blasting System is an economical way to convert any area into a quasi-Blast Room. The convenience of a Blast Room without the high cost associated with building one is the major benefit of this system. The system includes a High Capacity Pressure Pot, Sweep-In Media Recovery System, Media Abrasive Separator, and Dust Collector. Optional items include a 55 gallon Dust Drum Package which will automatically collect and store the accumulated dust in a sealed container. An Air Fed Helmet, Air Line Filter and Air Hose are also available to provide a clean air supply to the operator during the blasting operation. Operator sweeps Abrasive Blasting Media from blast room floor, up ramp and into the feed hopper. The abrasive then falls into the air stream and is carried through a heavy duty conveying hose to the abrasive separator for cleaning. The removable 3/16" screen traps debris. 14" high. 1500 RPC Cartridge Dust Collector designed for continuous duty blasting operations. Provides optimum dust filtration efficiency with minimum maintenance. Cartridge filters are automatically pulsed clean during operation. The HDPPB Series is a Contractor Grade, Portable Pressure Blasting System designed for Heavy Duty Portable Sandblaster industrial applications of all kinds. Productivity and safety are engineered into the design of these systems. KramBlast Crushed Glass Grit is a silica-free, consumable abrasive that offers aggressive surface profiling and coatings removal. 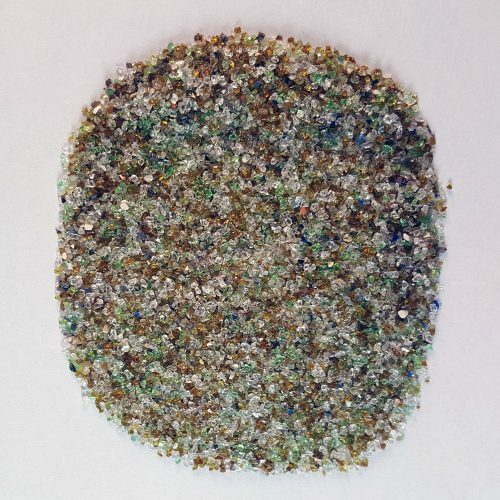 Manufactured from 100% recycled bottle glass, KramBlast Crushed Glass Grit produces a whiter, cleaner finish relative to mineral/slag abrasives.